Everywhere I turn I hear someone angrily calling out controlling pastors, and it has to stop. I often hear people use the term ‘spiritual abuse’ when sharing about challenges in their church. It seems to lend a clearly valid reason to leave a church, right? Not necessarily. I do understand that there are some horrible, selfish, mean spirited, controlling pastors—and congregants—out there. My heart is broken over situations like that. However, actual abuse is quite rare. I think it's tragic when rejection causes people to flee the church when it was rejection that caused Jesus to die for the church. Jesus was abused, hated, physically destroyed… yet he served the church. He forgave. We have people today who are leaving churches because of the most ridiculous reasons. When they don't get what they want, they accuse the pastor of control. Whenever accusation is in the mix we know someone has embraced a demonic anointing. He is the accuser of the brethren… and we should not be. I also believe that abuse of people towards leaders is extremely rare. My wife and I have been in ministry 21 years… and we've experienced some very difficult things. Very cruel people… gossip, division, mistreatment, etc. But we've never been close to being abused. I used to work for a 10/40 Window ministry. I've met Christian leaders in those nations who have been imprisoned in horrific conditions… stories of abuse like having a shotgun put in someone’s mouth because they didn't renounce Christ… they pulled the trigger and she lived. I could go on and on… pastors murdered in front of their congregation… another stripped naked and abused as he preached. I've seen piles of burning Christian bodies that were killed and torched by terrorists. So, no, I haven't seen abuse much at all. I've seen bad stuff. Tough stuff. Inconvenient stuff. Emotionally difficult stuff. Unfair stuff. My heart goes out to those who have been treated poorly by pastors. And my heart goes out to pastors who have been treated poorly by people. But, I won't call it abuse if it's simply a very bad trial. As I said, I understand what it is to endure extremely unfair actions by leadership that were emotionally painful and that resulted in trauma and hardship in our family. Going through these seasons are so painful, however as I look back I see just how important they were in our development, in our training, in our pursuit of love and humility. It’s easy to love everybody when you are celebrated. The real test comes when you are are treated wrongly. I believe this is a test that God will allow us all to take. Unfortunately, too many people take on a victim mentality and run away from their church assignment hurling accusations and screaming about abuse. Test failed. False-expectations can easily lead to offense. As part of the church, too many presume it’s the pastor’s job to coddle them and to jump through their hoops. In fact, it’s our job as the congregation to serve the mission of the church. It’s not the job of the pastor to serve ours. It will do all of us a world of good if we lay down our expectations and simply minister to God with passion! I’ll never forget a powerful moment when I was ministering in Connecticut several years ago. I was speaking at conference. After one of the final sessions, one that I was not speaking in, I was approached by a lady who presumed I was a pastor at the church. I told her I was simply visiting as a guest minister, and apparently that was okay with her. I was someone she could talk with. What she told me shook me to the core, and my definition of spiritual abuse changed forever. She told me her discussion with me was the final step in a process of healing for her. I didn’t understand, but I continued to listen. Several years ago she attended a church in the area. She went on to describe her experiences with Satanic Ritual Abuse (SRA). I won’t describe the grotesque abuses in this article, but simply know it’s enough to make you cry uncontrollably…and vomit. The fact that this lady regularly was abused in this manner in a church, by a supposed pastor, was beyond what the human mind could understand. After years of being emotionally incapacitated, God met her. He gave her an assignment of forgiveness and healing. She set out to do everything God prescribed her to do, and she was not at her final step. She drove to the city where the abuse took place, the city where I was ministering, a place that she never returned to. She avoided it like the plague (to her it was) for years. So, there she was, standing before an unsuspecting visiting minister releasing forgiveness to her abusers, decreeing her own freedom and finding healing. It was a spine-tingling, absolutely remarkable moment. This lady was abused. I hope you can now see how most accusations of abuse will never even come close. Am I unsympathetic toward those who are treated poorly? No. I’m really not. But, I must admit, I actually expect God to put people in those situations. So, I don’t immediately rush to judgment of the pastor and I don’t immediately attempt to rescue them from their pit. It’s there where character is built. Joseph was wrongly thrown into a pit, sold into slavery, cast into prison…and ultimately made the second most powerful person in the nation. Why was Joseph welcomed into the palace? Because he passed the test of the pit and the prison. He forgave and loved his brothers, the very ones who tried to destroy him. I wonder how many people who are leaving churches, hurling accusations against their pastors, realize they are doing great damage to their lives. The palace that God has for them a couple decades down the road (Joseph waited over 20 years between being thrown into the pit and seeing his brothers again) may never be enjoyed. A failure to bless those who curse will result in a failure to fulfill your life calling. I’ve met many people who are so disillusioned by the church that they are attempting to form doctrine that neuters leaders of their authority. They don’t believe in any measure of rank or hierarchy and are quick to assault those who do. Many are leaving the institutional church and forming house churches. They cite 1 Corinthians 14:26 as evidence that leadership is unnecessary and even unbiblical while ignoring Hebrews 13:17. I’ve heard people say that pastors and leaders should not be designated, they should not be preaching, they should not even be there at all as everybody is at the same level and everybody can bring ministry equally. This is not true, friend. Many house churches are fully biblical and ordained of God, but many are movements of rebellion, full of wounded and disillusioned people who are rejecting leaders who have failed them instead of welcoming them to the table as Joseph did with his brothers. I write more about this in my book Covens in the Church. I’d encourage you read that, especially if you have been tempted to leave a church. The truth is that God will supernaturally impart grace to endure seasons of testing. There will be many tears and many questions…and you can absolutely ask those questions! But, do so with a humble heart. Don’t attempt to figure out who is right and who is wrong? Why? Your leadership may most certainly be wrong, but that’s not the point of focus—your response is. Will you respond in love and humility, or will you become an Absalom, demanding attention is given to your particular problem or point of view? God is well able to give you supernatural strength to endure the pit, the test. The focus is not on who was wrong, but on how we respond when wronged. Is there ever a time to leave a church? Yes, but it's much less often than you'd think. If God leads you to leave a church, it's not a decision you make alone. Your pastor must play a part, and significant process must take place before you move on… with a blessing. 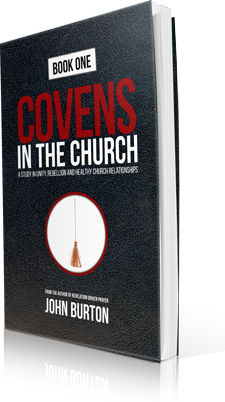 You can order Covens in the Church and other resources at www.burton.tv/resources.